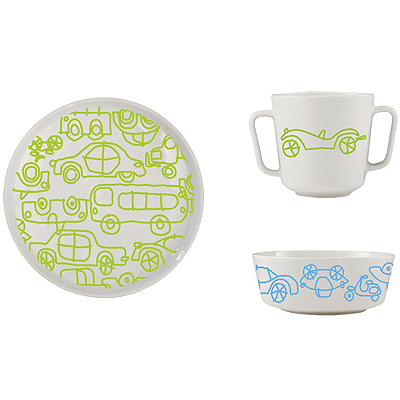 This “Transport 3-Piece Porcelain Dinner Set” is action-packed with blue and green line-drawings of everything from school buses to of course, scooters. The set come with a small plate, a small bowl, a two-handled cup all in a gift box. 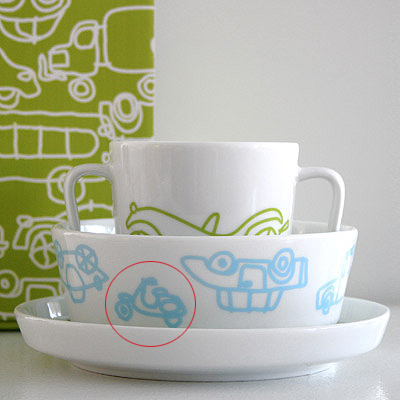 These are designed to help kids make the transition from sippy-cups to big-kidsâ€™ cups to real dinnerware. A nice gift set for kids (and parents) if you ask me. But a bit pricey at $34. This entry was posted in Ceramics, Pottery, Food, Wine and tagged kids, scooter, snack set, vespa by Tracy. Bookmark the permalink.